After a lengthy lockout, the NFL is back in action and Bears fans have a lot to be excited about in the coming season. The defending NFC North Division Champions bring back a number of the best players in the league, and hope to defend their division crown. This year’s Bears team will have a number of new faces. Veteran center Olin Kreutz won’t be at center for the first time in 13 years, but the team will be younger and faster on their offensive line. The team’s first round pick in this year’s draft, Gabe Carimi from Wisconsin, will fight for a starting job during training camp with a number of veterans, including new addition Chris Spencer. The NFL made a rule change that could impact the Bears this year. Kickoffs have been moved up five yards from the 30 to the 35 yard line in an effort to protect players from violent collisions. Unfortunately, Devin Hester and Johnny Knox are two of the best return men in the NFL. It will be interesting to see if the rule change sticks, or if Hester and Knox are forced to bring the ball out from deeper in the end zone. At quarterback, Jay Cutler returns to lead the Bears offense. He has already put up some of the best career numbers at the position in the long history of the Bears, and looks forward to taking advantage of some new weapons this year. Wide receivers Roy Williams and Sam Hurd and running back Marion Barber we signed away from the Dallas Cowboys to bring a different look to the attack Cutler and offensive coordinator Mike Martz plan for each week. Kellen Davis will be asked to step up at tight end after the Bears traded away veteran Greg Olsen before training camp began. With Matt Forte, Chester Taylor and Barber at running back, the Bears have good depth for all situations this year. On defense, Brian Urlacher, Lance Briggs and Julius Peppers return to a unit that will have to stop some of the best offenses in the NFL this year. Peppers will be joined by a few new names on the defensive front, including Amobi Okoye and 2011 draft pick Stephen Paea. Peanut Tillman returns to lead a secondary that will be tested by some of the best players in the NFL. 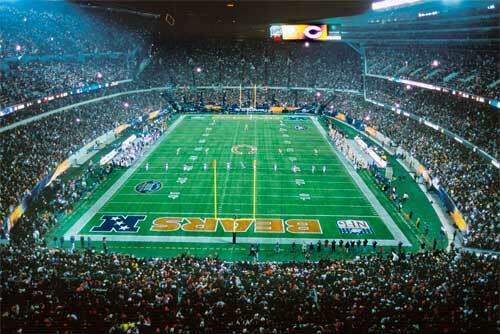 The Bears open their 2011 regular season by hosting the Atlanta Falcons on Sunday, Sept. 11. To look for tickets to the Bears’ home opener or any other games played at historic Soldier Field this year, click here. This entry was posted in Sports and tagged Brian Urlacher, chicago, Chicago Bears, football, Julius Peppers, Lance Briggs, NFL. Bookmark the permalink.